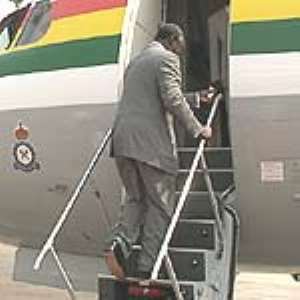 Accra, July 4, GNA - President John Agyekum left Accra on Sunday for Addis Ababa, Ethiopia to attend the Third Ordinary Session of Head of States and Government of the African Union (AU) from July 6-10. The First Lady, Mrs Theresa Kufuor, Kwabena Agyepong, Presidential Spokesperson and some senior government officials accompanied him. Speaking to newsmen Mr Agyepong said the session, which is under the theme "Gender Mainstreaming and equality", would discuss issues such as the implementation of the Maputo declaration on HIV/AIDS and malaria among other diseases. He said it would also review conflicts in Africa especially at Darfur in West Sudan, the security situation in Democratic Republic of Congo, Rwanda and the conflict between Eritrea and Ethiopia. Mr Agyepong said President Kufuor in his capacity as ECOWAS chairman would brief the summit on transitional arrangements in Liberia and renewed efforts for peace in Cote D'Ivoire. He said there would also be a meeting of African First Ladies to be chaired by the First Lady of Gabon, to discuss HIV/AIDS and how to minimise its effect on the continent. The Executive Council meeting of the Union's Foreign Ministers is already going on in Addis Ababa with Nana Akuffo-Addo, Foreign Minister participating. Some Ministers of state, the Inspector General of Police, Nana Owusu-Nsiah and the Dean of Diplomatic Corps, Mr Ibrahim Omar saw the President off.